Pest Control Career Opportunities | Anteater Exterminating Inc.
Are you interested in a one-of-a kind job? Do you want to help people who are in need and looking for a dependable, professional to handle their pest problems? Anteater Exterminating Inc. offers unique opportunities for a solid career. Anteater Exterminating Inc. is always looking for motivated, self starting members to join our team. If you have the desire to help customers when they want effective service, a professional attitude and the assurance that comes with knowing they have hired a competent pest control technician, then Anteater Exterminating Inc. has a place for you on our team. Anteater Exterminating Inc. has established a strong history of professional pest control in Phoenix, AZ and it’s surrounding areas. We are proud of our highly trusted reputation. All of our employees have solid foundations backed in highly trained methods and education. We will share our knowledge and experience with you to ensure you are properly and fully trained. When customers think of Anteater Exterminating Inc. they think of the individual pest control technicians – and our values. We depend on the motivation, skillfulness, and dedication of every associate; our successful results only add to our reputation. Together, our management and professional employees are direct representatives of our goal of being Arizona’s best pest control service company! 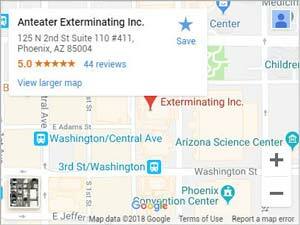 We are only as good as the people that represent Anteater Exterminating Inc. in front of our customers. If you are ready, willing and able to take care of our customers as a top quality exterminator or administrative staff member, we want you to become a member and representative of Anteater Exterminating Inc.